North of the confluence of the Feather River and the Yuba River is the city of Marysville, which was a stopping place between Sacramento and San Francisco during the Gold Rush. Hydraulic gold mining raised the river beds so high that the city flooded every winter. 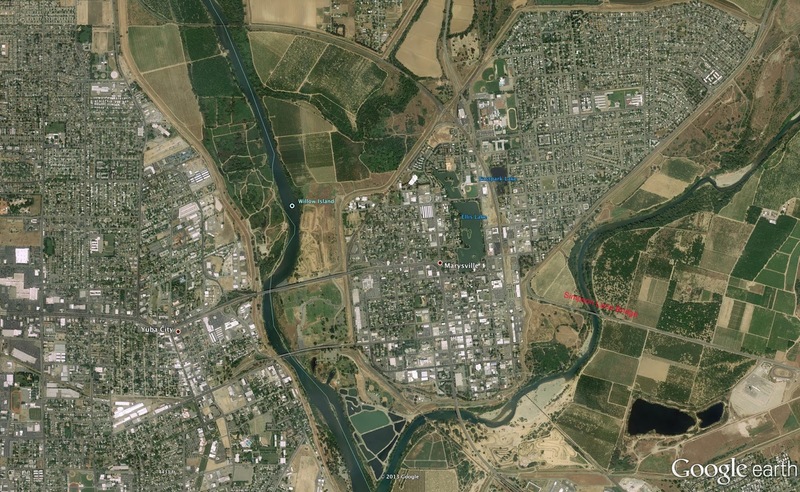 A levee system eventually protected the city from floods while restricting further city growth (see Google Earth photo below).Yuba City sits on the west side of the Feather River in Sutter County. The Simpson Lane Bridge (16C0001) is the easternmost bridge across the Yuba River in Marysville. It is a five simple span 'T" girder bridge (on a 30 degree skew) that was built in 1957. It looks like the bridge was widened with exterior precast girders, probably to give it legal shoulder widths in 1987. The superstructure is supported on tall, thin pier walls on oblong foundations cast into what looks like steel soldier piles. Two piers sit in the river, two piers sit on the banks, and the abutments are at the top of the levees, well away from potential flooding. The bridge is composed of 83 ft long spans for a total length of 418 ft. It has a sufficiency rating of 89, which is pretty good but it has a poor deck rating and it also needs bank protection. Yuba County, California Bridges: Simpson Lane Bridge across the Yuba River by Mark Yashinsky is licensed under a Creative Commons Attribution-NonCommercial-NoDerivs 3.0 Unported License.